Do you ever wonder where the meat of that burger you’re about to bite into came from? Personally, by the time the food is ready to eat, all I am thinking about is what is the fastest avenue for the hamburger to get from the plate and into my belly! With the increase in availability of radio frequency identification chips, the cattle industry has taken upon itself to create safety measures for tracking specific cattle information. Some of the metrics used are age, weight, and even what the cattle eats. This saves a significant amount of time compared to not using RFID chips because before the farmers or slaughterhouse would have to manually look up that information. This is also all dependent if they wanted to have that information. One of the more impactful attributes is being able to track mad cow disease. In the past, if a cow was found to have the disease, the Animal and Plant Heal Inspection Service would just be able to track the cow to the livestock farm where it was raised, and then the entire herd of cattle would be put down. With RFID chips in each cow, they can track the cow’s lineage, resulting far fewer cows being put down which saves the farmer a significant amount of investment. With all of the advances and easy of use with RFID technology in cattle, most farmers are still quite skeptical about implementing it. 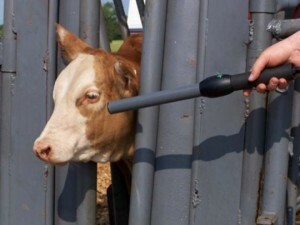 Right now in the United States, only 10 percent of farmers actually take advantage of RFID tagging for their cattle. This is because most livestock owners have roughly 100 cows or less so those famers do not see the need in going through the hassle of setting up a RFID system. To effectively run a good tracking system one needs to purchase and setup the chips, scanners, specialized software and a computer to run that software. Also a farmer needs the time and training to input and analyze the data. So a proper system might me more suited for farms with over 100 cattle to keep track of. It is also important to mention that mad cow disease is still an extremely rare occurrence and RFID chips cannot help prevent the disease it just makes it easier for the farmer to find the source, so it might not be worth the effort. With this ability to track cattle data, farmers can more accurately forecast when cows will be prime for the slaughterhouse as well as save time in tracking data over the years. Vital Herd, one of the nations leaders in cattle tracking, says it can save over 4 million cattle per year by intensively tracking diseases among cattle which will be beneficial for all farmers in the end. With the buying and selling of meat in this country being a massive industry, do you think there should be a federal mandate to use RFID tracking to more safely track diseases?